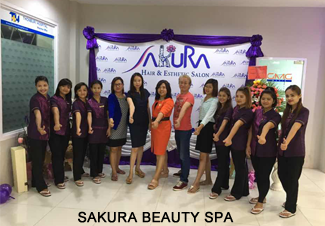 Japanese cosmetic salon "Sakura Beauty Spa" opened on May 25, 2017 within a commercial facility in Myanmar's largest city of Yangon. Mr. Koko, a co-owner and deeply related in Japan, said with he wanted to provide Japanese technology and services. It was opened on the 5th Floor of the shopping mall “Ga Mone Pwint” on the Insein street since September 2016. In the store Menard cosmetics where Mr. Ko Ko serves as a distributor and Milbon cosmetics etc are handled, Japanese stylish are stationed. Mr. Ko Ko who is a main distributor of Menard Cosmetic from Japan and in the Sakura Beauty Spa where he distributes and handles Milbon cosmetic and also have Japanese stylish serving for haircut. After living in Japan for about 20 years since the 1990s, Mr. Coco returned to Myanmar after being transferred to civilian rule. I manage a Japanese language school and dental clinic. A merchant store for Menard cosmetics is also set up in "Junction City", a commercial facility in central Yangon.